A Companion to the Master Kit. 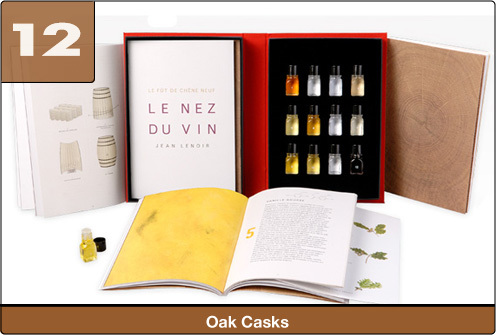 The only instrument that will help you identify and memorise the 12 distinctive and most common aromas found in oak cask aged wine. After two centuries of life, the heart of the oak tree gives soul to the wine and raises it to the ranks of the aristocracy. Every taster should respect this sacrifice. The species, origin, age, drying methods and level of barrel toast all help to give fine wine its extra special charisma. The Oak Kit comes with a beautiful 67 page color book with an abundance of illustrations and diagrams. A must have for all aficionados and wine makers.